Indeed, let’s give thanks to God for overcoming our reluctance to engage in wars of choice thousands of miles from American shores. Wars that debilitate the U.S. even as they spread destruction among the peoples of foreign lands. 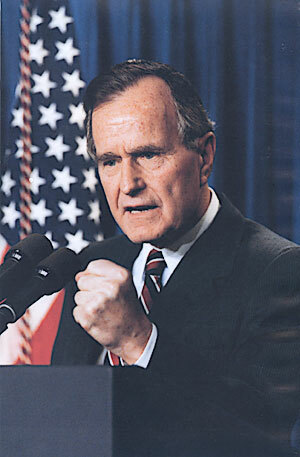 Let’s return to President Bush’s phrase and deconstruct it. “It’s a proud day for America.” Proud because the U.S. military, aided by coalition forces, defeated an Iraqi opponent that possessed a third-class military? To use a sports analogy, would the New England Patriots football team be “proud” of defeating a Division III college football team? “By God.” Does God really march solely with American troops? Did America win because its god is bigger than the Iraqi “idol” god, as Christian soldiers like General William Boykin have suggested in the past? “Kicked the Vietnam syndrome once and for all.” So it’s a good thing America has “kicked” its reluctance to engage in costly wars of intervention, not only in the immediate aftermath of Desert Storm, but for “all” time? “It’s a proud day for Germany. And, by God, we’ve kicked the Hitler/Nazi syndrome once and for all.” Said by a newly unified Germany after invading Poland in 1991 to reclaim territory ceded in the aftermath of World War II. “It’s a proud day for Russia. And, by God, we’ve kicked the Afghan War syndrome once and for all.” Said by Vladimir Putin after Russia’s invasion and conquest of Ukraine. Now, imagine how U.S. leaders would respond to such statements. Would they not be denounced as bombastic? Propagandistic? Delusionary? One might argue that Desert Storm was an international “police action” in response to Iraqi aggression. OK. How about America’s ongoing war in Afghanistan? The invasion of Iraq in 2003? The destabilization of Libya? An open-ended, and apparently never-ending, “global” war on terror? The real “Vietnam Syndrome” was not a reluctance by the U.S. to use military force in the aftermath of that war. It was a reluctance to face the legacies and lessons of that war, a failure truly to learn from its violent excesses, a failure to say “no, never again” and to mean it. By continuing to wage unwinnable wars in regions of marginal interest to the American people, the country is slowly succumbing to this syndrome. The cure is simple: put an end to these wars. Only then can an American president truly speak of taking pride in kicking the Vietnam syndrome once and for all.